My husband’s brother and wife are expecting their first baby, and..."it’s a GIRL!!!" I jumped at the chance to throw my sister-in-law a baby shower. 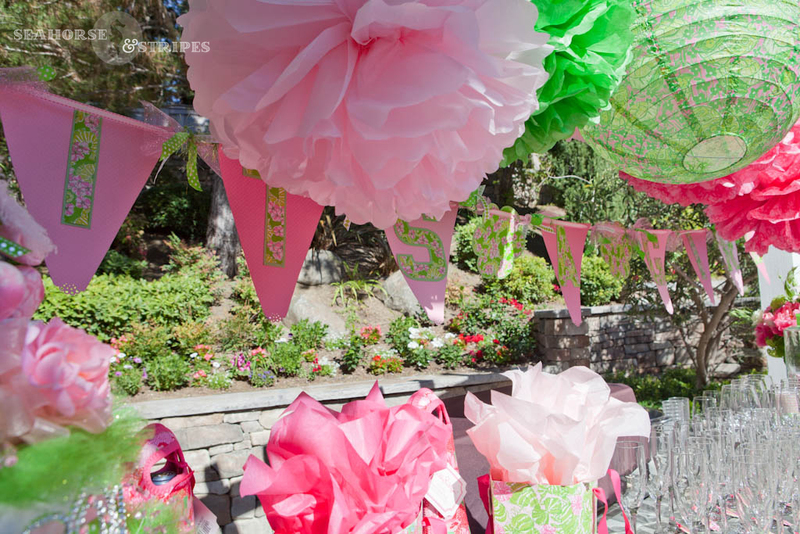 I love all things Lilly, so I decided to go with a pink and green Lilly Pulitzer-themed shower. 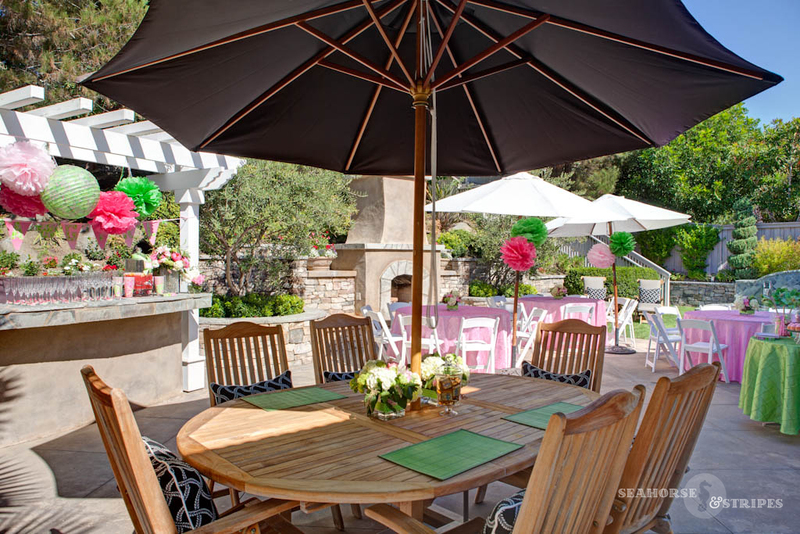 The shower took place in my home last weekend and I am dying to share with you all the fun things I made and found that brought the theme together. 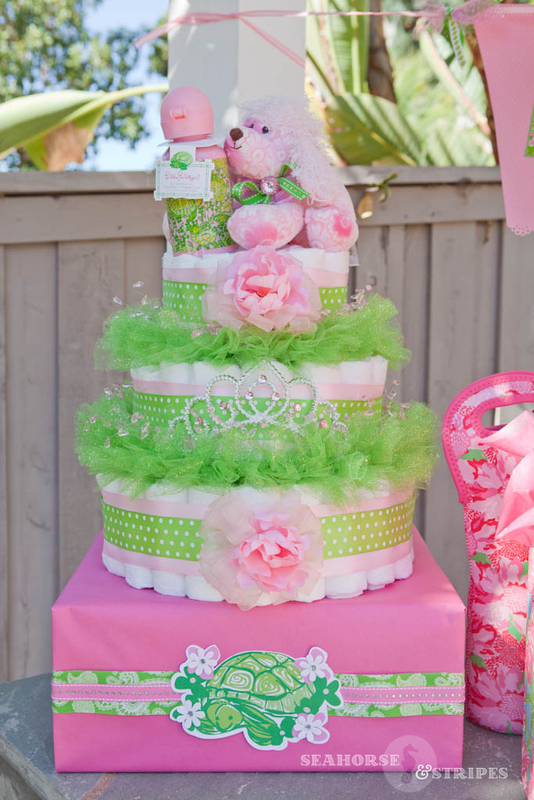 The first item I made for the shower was a pink and green diaper cake, complete with a tutu. 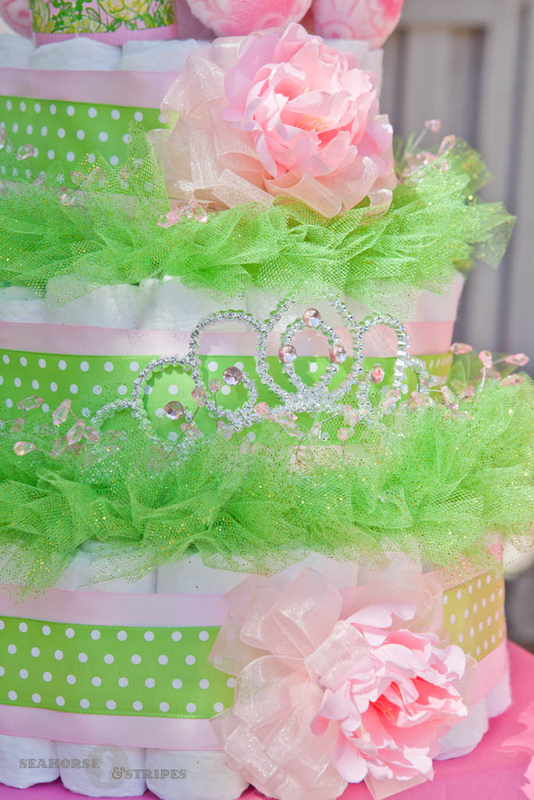 I love making diaper cakes, and I decided to make this one a little more unique by adding a tulle tutu on the second and third layers of the cake. I love how it turned out; it’s so girly!! 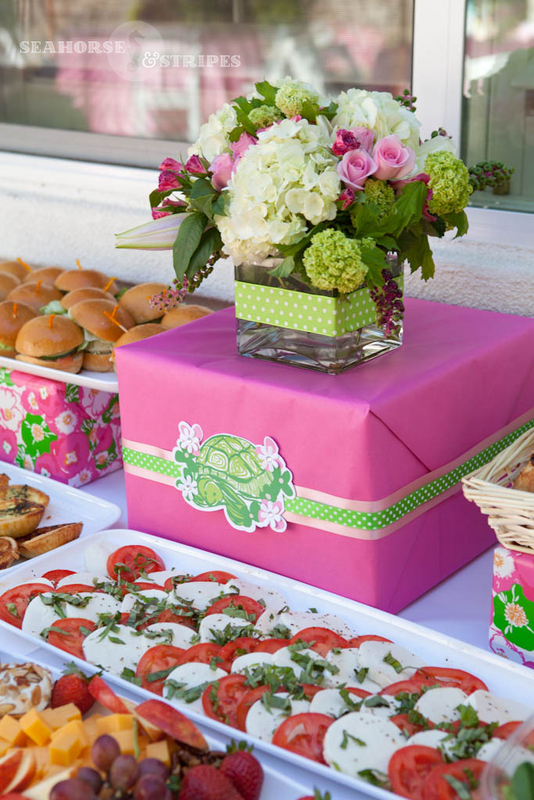 At a local San Diego Pinkalicious store, I found some darling Lilly Pulitzer wrapping paper. 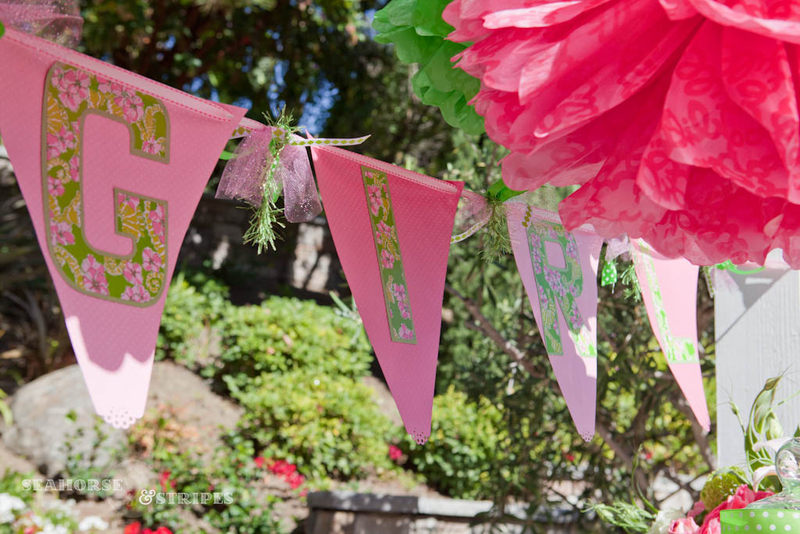 The paper inspired me to create an “It’s a Girl” baby shower banner. Using the wrapping paper, I cut out block letters for the sign and then backed the wrapping paper with a shimmery lime green card stock. Once I had the letters completed, I then worked on cutting out flags for the banner. I used coordinating party ribbon between each letter. 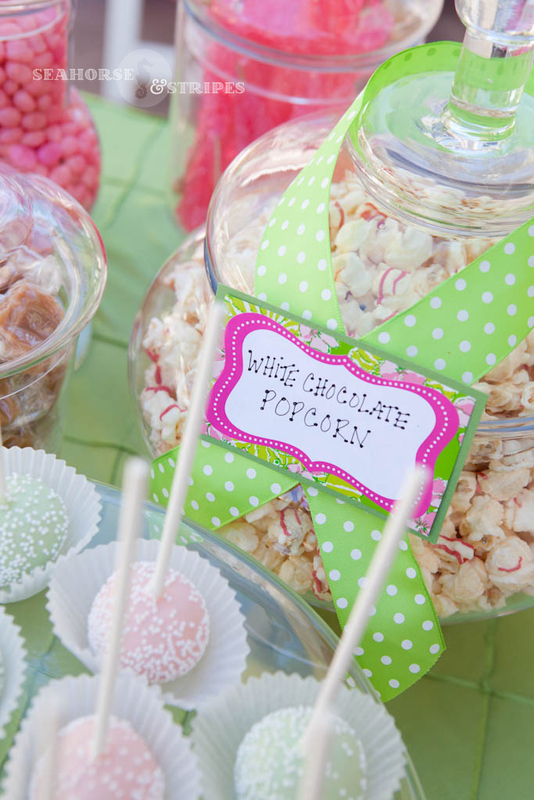 Every party has plenty of sweets, and that is true for my parties too! 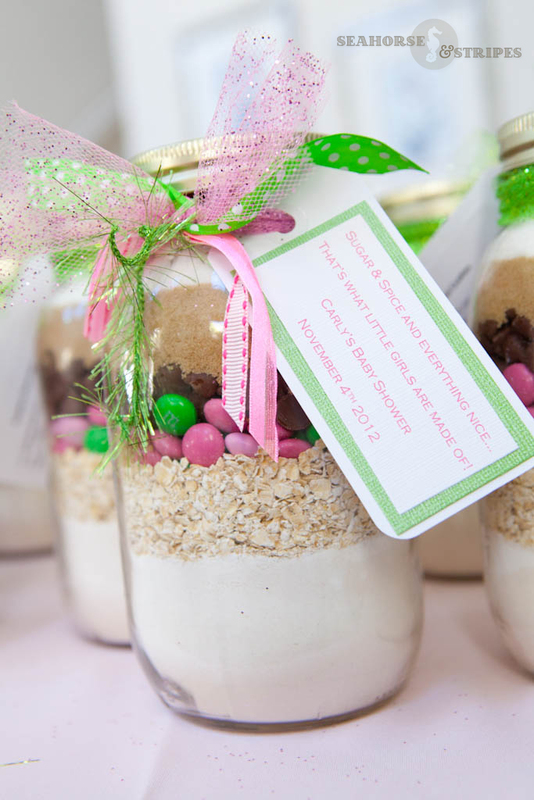 Speaking of sweets, I am so excited to tell you about these really fun and yummy mason jar cookie favors. 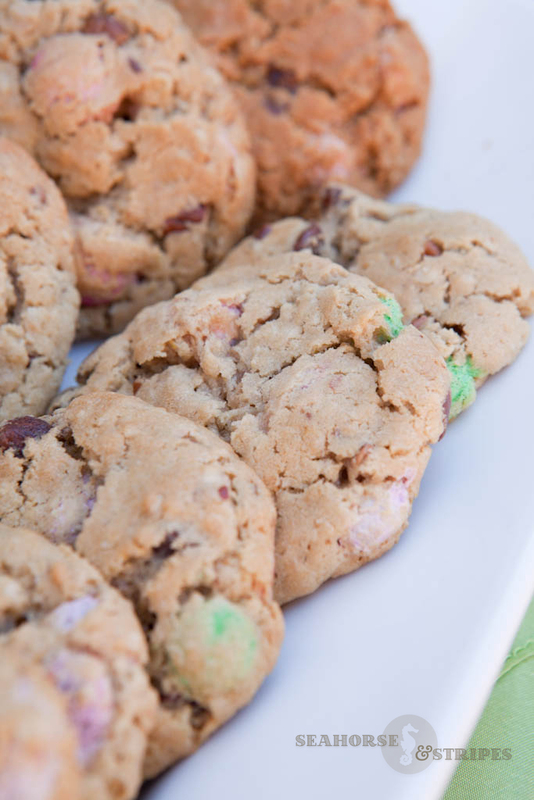 I found the recipe on Bakerella. 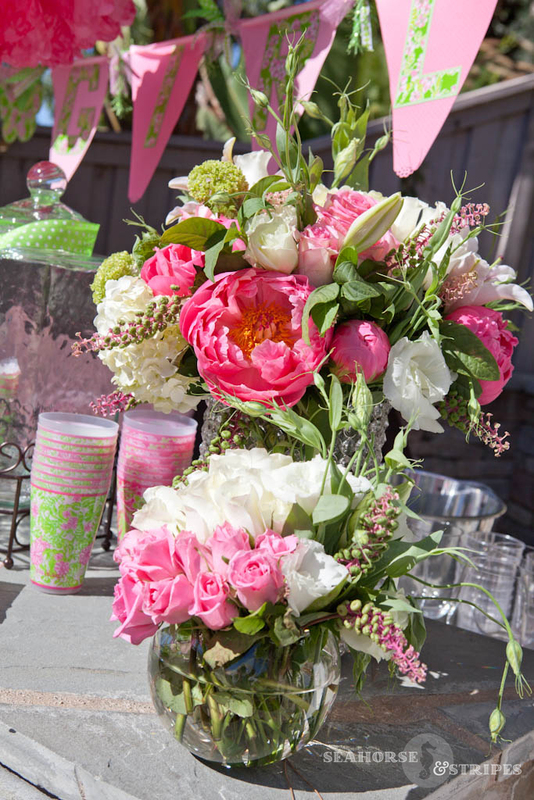 One of my favorite things to do when I throw a party is the flower arrangements. Franco’s Flowers is my preferred local flower wholesaler and I am never disappointed when I go there to find flowers for my arrangements. This time, I knew I would do pink, green and white, but it wasn’t until I found the Pokeweed shrub, that it all came together for me. 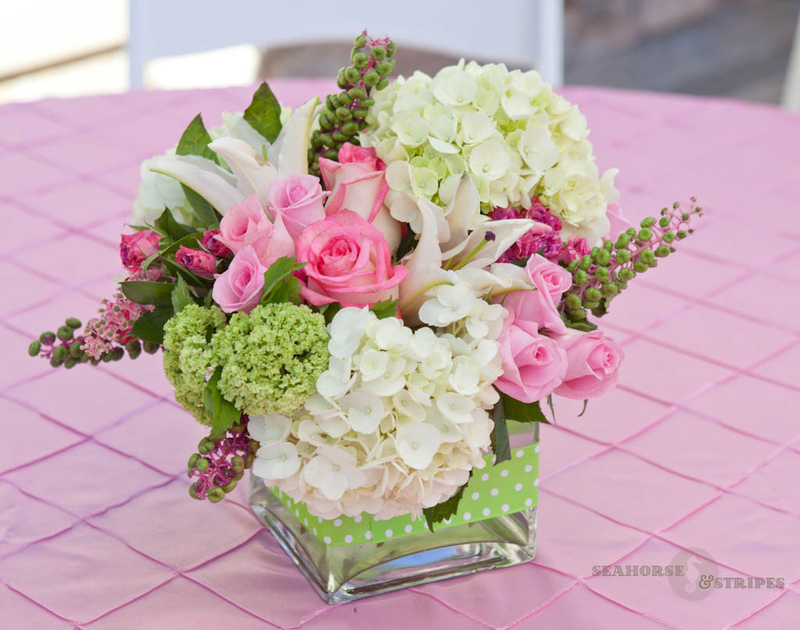 The arrangements have Ecuadorian Roses, Garden Roses and Spray Roses, Hydrangeas, La Mancha Lily, Green Snow Balls and Pokeweed. 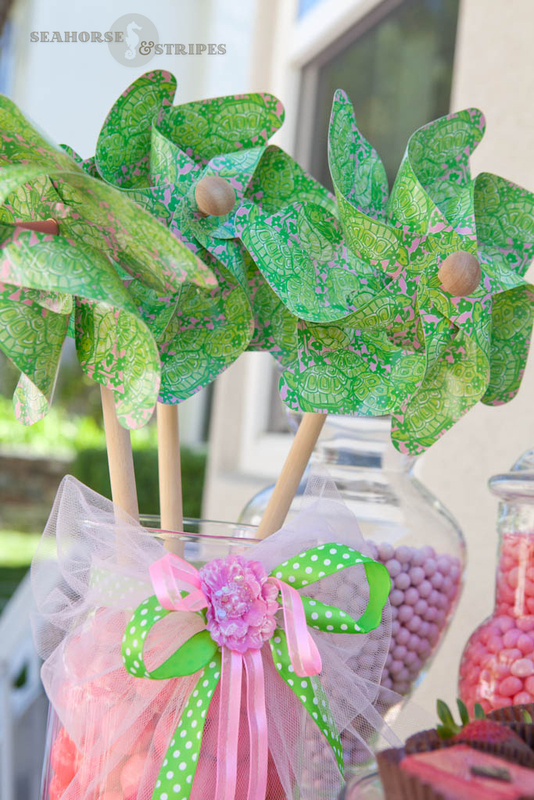 I used lime green polka-dot wired ribbon and wrapped it around the vase to complete the look. For fun, I decided to make mini cocktails for the baby shower. 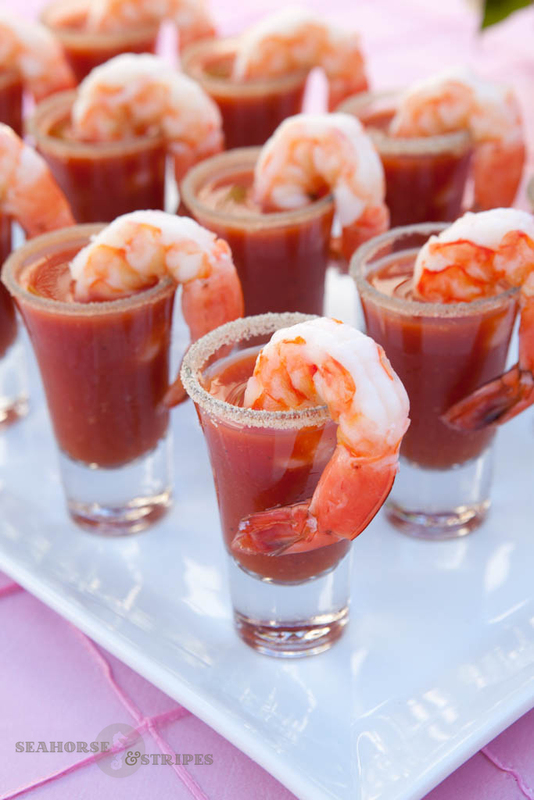 The first one I decided on was a Shrimp Cocktail Bloody Mary. Note: The night before the baby shower, I rimmed the glass with a lime wedge and then gently dipped the glass in celery salt and placed the glasses in the freezer. The second cocktail I made was a Champagne Cocktail with Chambord. This one was very easy and so yummy!! 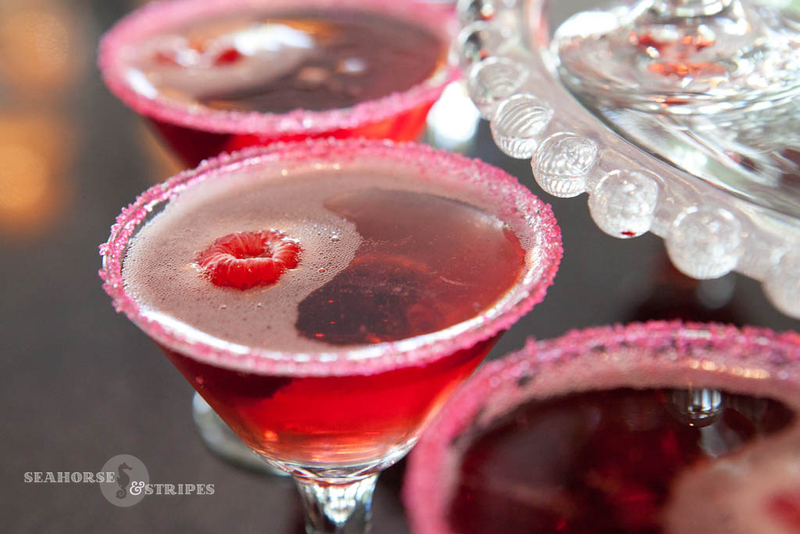 In a 3 ounce mini martini glass pour in ½ ounce of Chambord. Top with a Rose Brut Champagne (I used Mumm). 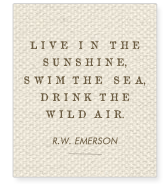 Float one raspberry in each glass. 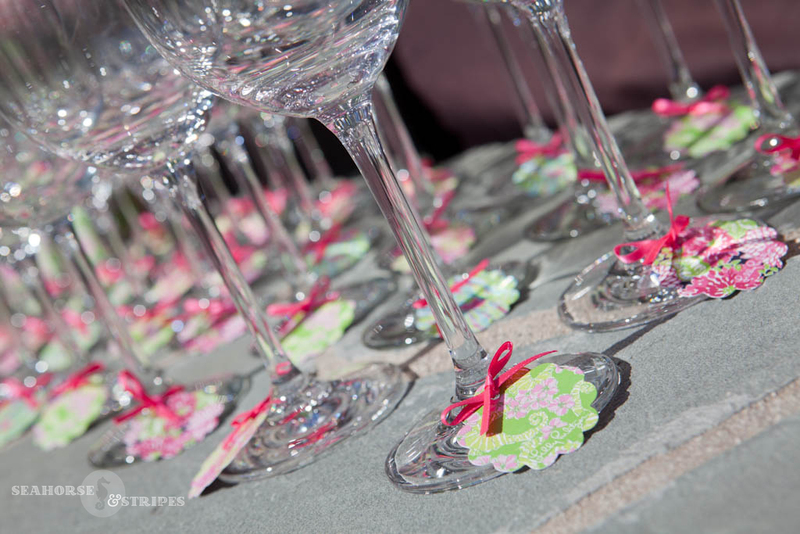 Note: The night before the baby shower I took a lime and rimmed the martini glasses with Cake Mate pink crystals (I found in the grocery store). I also stored the glasses in the freezer until just before the party. Last but definitely not least is the Raspberry Bellini. *1 cup of sugar and 1 cup of water. On medium heat stirring regularly, dissolve the sugar into the water until it is clear. Let cool completely before adding to the mix. In a blender, mix all ingredients and puree. 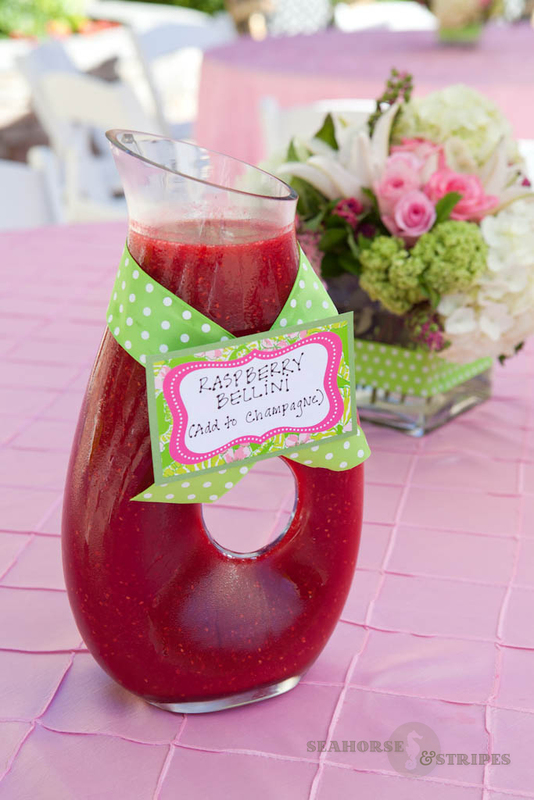 Fill a champagne flute ½ full with champagne and then pour in approximately 3 tablespoons of Bellini mix. 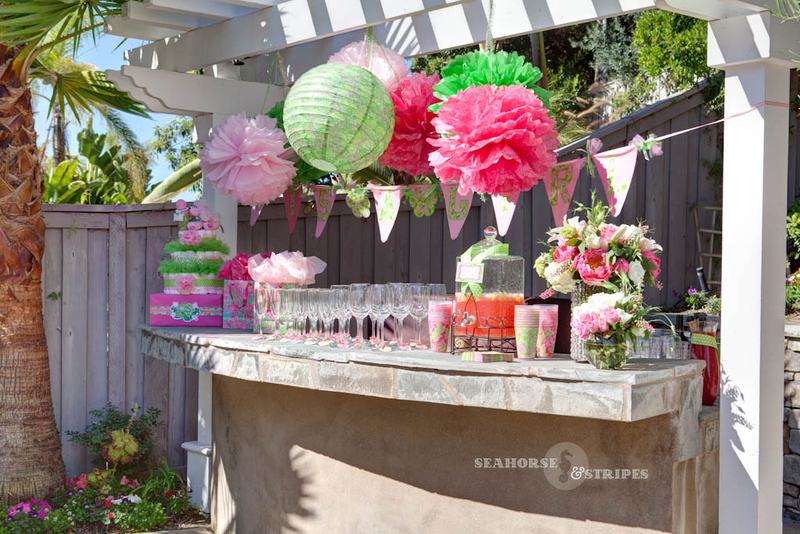 Hey, this baby shower cocktail looks so much fun. 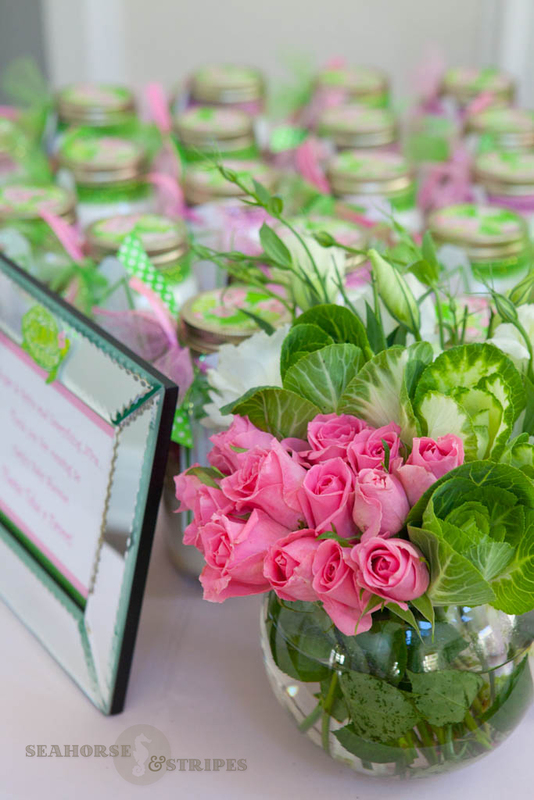 Totally adorable arrangements! Gratitude for sharing these wonderful photos. My best friend is also expecting so I will throw a fun DIY bash on the next week. I will be booking one of her favorite venues in Chicago for this bash.